Bespoke has entered into a contract with Callendar Estate for the management of a proportion of the Estate’s path network including its mountain bike trails. This will involve carrying out a program of monitoring and reporting and where necessary carrying out routine maintenance work such as the clearance of culverts, litter collection as well as small scale trail repair work. Any larger scale repairs to the path network would fall outwith the scope of the contract but could be carried out by the company as a separate arrangement. The payment made by Callendar Estate to Bespoke for delivering this service will cover the ongoing costs of running the company including insurance, maintenance of the website, the purchase of small tools and equipment etc. The majority of the work to be delivered under the contract is suitable for volunteers. If you would like to help and do your part for the community then Contact Us. 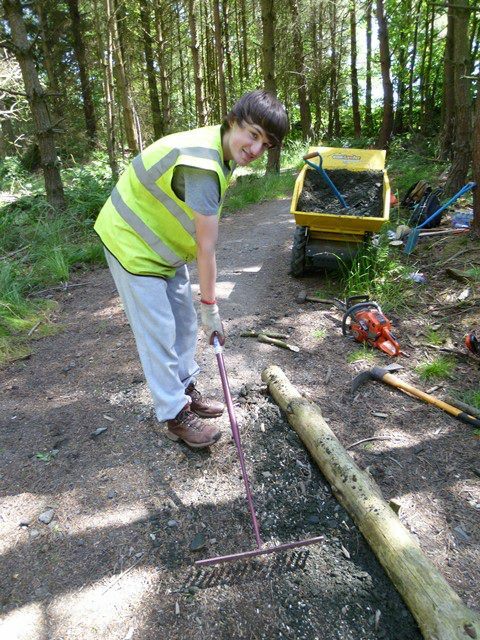 Over the summer of 2013, Bespoke launched a pilot scheme to offer school leavers and university students the opportunity to gain some practical, hands on work experience…The Trail Crew was born! Every Tuesday the crew met and began maintaining and reinforcing the Green trail as it had started to show early signs of erosion from the volume of trail users taking to our trails, which is no bad thing! The program proved to be a success combining essential maintenance and offering valuable work experience for all those who participated. With this in mind we hope to be able to continue to offer this opportunity in the future as well as many other training and learning opportunities.